The Porsche 597 “Jagdwagen” started life as a design submitted by Porsche in response to a call to tender by the German army during the 1950s. With its switchable all-wheel drive and trough-like monocoque bodyshell, it could withstand almost any type of terrain – both on land and water. However, only 71 units of the off-road vehicle were built. 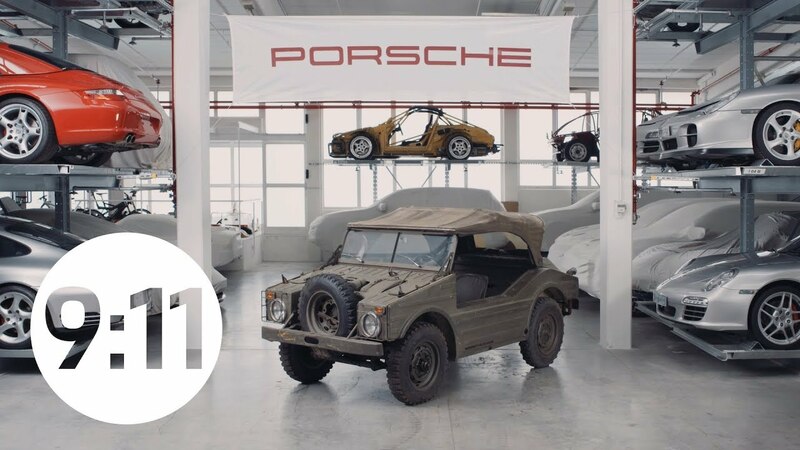 A call to tender by what would later become the Bundeswehr in 1953 prompted Porsche developers to begin work on an off-road vehicle for the military. The vehicle needed to be fast, agile and lightweight yet offer the greatest possible load capacity – as well as being suitable for off-road use, reliable and easy to service. Along with Auto Union (formerly DKW) and Goliath, a Borgward subsidiary, Porsche was one of three German manufacturers involved in the tendering process. The designers equipped the type 597 “Jagdwagen” with a modified four-cylinder flat engine from the Porsche 356, located in the rear of the vehicle. This provided some 50 hp, allowing the vehicle to demonstrate impressive driving dynamics despite its inclination towards off-road capabilities: Weighing in at around 870 kilograms and offering a top speed of up to 100 km/h, the Porsche 597 was extremely agile for a military vehicle. The flat engine delivered power to the rear axle via a synchronised four-speed transmission with an additional off-road gear. Its switchable front-wheel drive made the 597 the first all-wheel-drive vehicle to bear the Porsche name. In all-wheel drive mode, the car could scale inclines of up to 65 percent at 1,000 rpm. The Jagdwagen could also be used on rivers – its compact monocoque bodyshell meant that it could float across the surface of the water. As a result, an early version of the vehicle was produced without any access doors. As early as January 1955, the manufacturers presented the first prototypes to the government at the Bonn/Hangelar airfield to demonstrate the suitability of their vehicles. The Porsche Jagdwagen generated a great deal of interest and during the following months was also presented at British and French military bases in Germany. An expert audience was given the opportunity to see Porsche’s most recent development at the Geneva Motor Show in March 1955. Over the next few years, Porsche worked to develop the Type 597 “Jagdwagen” in preparation for series production: The version produced from the end of 1957 featured a more sharply sloping front and the addition of four steel doors. Despite successful testing, Goliath and Porsche were only permitted to produce a further 50 units for test runs for the Bundeswehr, which was officially founded on November 12, 1955. Owing to financial reasons and labour market policy, the contract was awarded to Auto Union in Ingolstadt, prompting Porsche to halt work on the project. In total, Porsche manufactured 71 units of this early off-road vehicle. Only around 50 of these vehicles still exist, making the “Jagdwagen” an especially rare model. Today, the majority of “Jagdwagen” owners are involved with the Porsche Jagdwagen Registry e.V. – presumably the smallest Porsche club in the world. At the AvD Oldtimer Grand Prix, Porsche celebrated an automotive legend.